"Delicious peanut sesame chicken dish, served over pearl rice (sushi rice)." In a medium saucepan, bring the 2 cups water and rice to a boil. Cover, reduce heat to low, and simmer 20 minutes. Heat the vegetable oil and sesame oil in a large skillet over medium-high heat, and saute the green onions and garlic until tender. 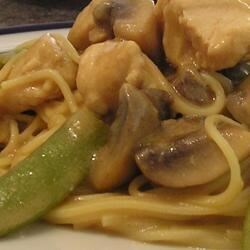 Mix in the chicken and mushrooms, and continue to cook and stir about 5 minutes. Mix in the rice vinegar, soy sauce, and sesame seeds. Reduce heat to medium-low, and simmer 20 minutes, stirring occasionally. In a bowl, mix the cornstarch and 2 tablespoons cold water. Stir the cornstarch mixture and peanuts into the skillet and cook for a few minutes over high heat to thicken. Serve over the cooked rice. See how to make classic Chinese take-out at home. It tasted great but it didn;t make enough sauce to coat the rice.